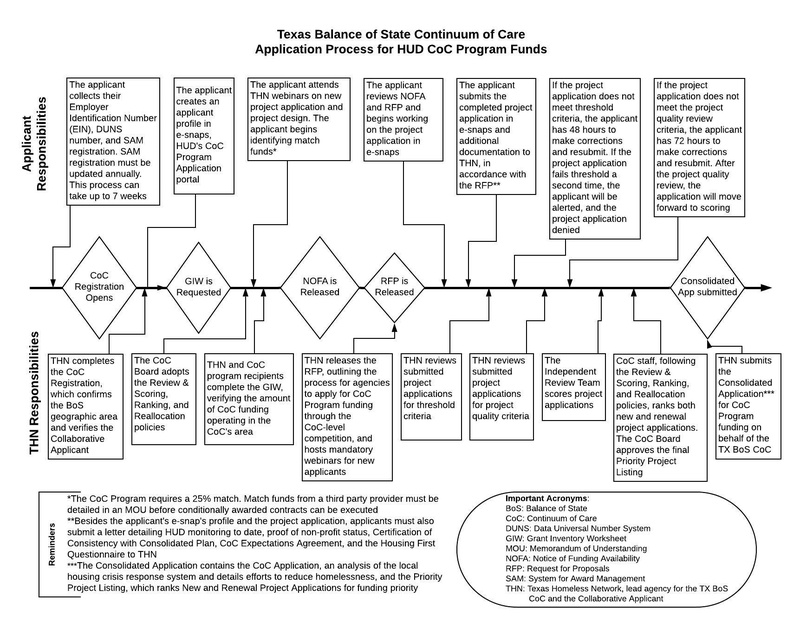 The Continuum of Care (CoC) Program is designed to promote community-wide commitment to the goal of ending homelessness; to provide funding for efforts by nonprofit providers, states, and local governments to quickly re-house homeless individuals, families, persons fleeing domestic violence, and youth while minimizing the trauma and dislocation caused by homelessness; to promote access to and effective utilization of mainstream programs by homeless individuals and families; and to optimize self-sufficiency among those experiencing homelessness. THN serves as the “Collaborative Applicant” for the TX BoS CoC and leads the HUD CoC Grant process. THN provides technical assistance and guidance to agencies and communities applying for funding to create new housing and service programs. Applicants must submit proposals through THN in the annual CoC Program competition. This Prezi is a great overview of HUD’s CoC program. Visit the Archives page to view prior TX BoS CoC Program Grant Materials. TX BoS CoC PSH Eligibility Packet– v3.0 Please check for updates periodically.